The Massachusetts Animal Coalition is a statewide tax-exempt, not-for-profit organization of Massachusetts animal welfare professionals and dedicated volunteers who have put their differences aside and their heads together in an effort to effect change for animals in Massachusetts communities. Now in its 18th year, MAC members have created strong alliances and developed new programs and initiatives that are benefiting an ever-increasing number of Massachusetts animals. Created in February 2000, MAC has worked hard over the years at forming alliances and developing programs in various areas of animal welfare, all with an eye toward improving the lives of our companion animal friends. Since its inception, MAC has provided a forum to network, collaborate and learn. MAC has acted as a facilitator to foster ideas, develop expertise, and generate support for animal welfare activities – all in an effort to provide “animal people” a way to promote their ideas and receive support as they carry out their programs and projects. While there is certainly much more to work on, MAC has a bright future as we look forward to tackling more and more issues as a united front. MAC has four standing Programs (Animal-Friendly License Plate, AniMatch-Dog and AniMatch-Cat, Educational Meetings and Spay Mass). MAC also sponsors Task Forces that are working on particular projects. 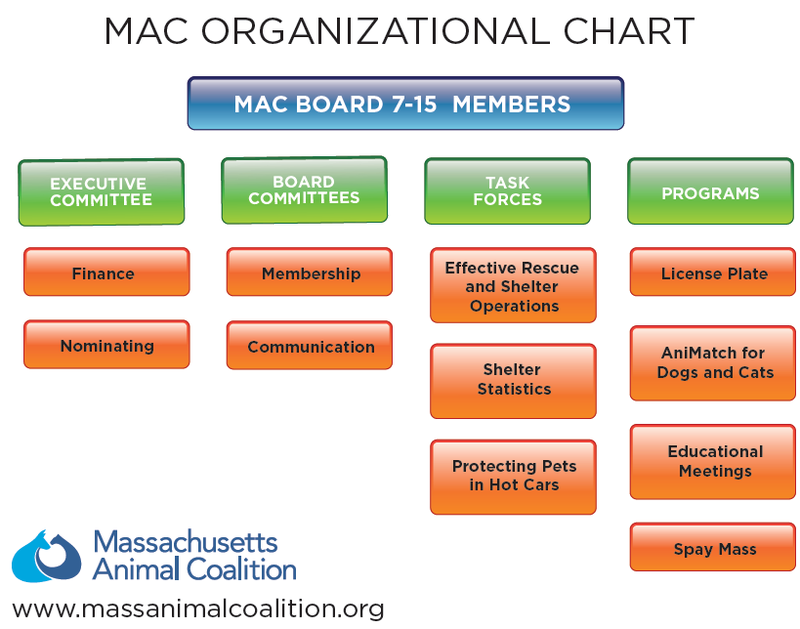 MAC’s approved Task Forces engage in collaborative endeavors to benefit Massachusetts animals. MAC serves as an umbrella and incubator allowing Task Forces to get started on their work without having to form a tax-exempt, non-profit organization, set up a Board of Directors, and address all required government annual filings. If you are a MAC member and are interested in exploring the idea of a MAC Task Force that is in keeping with MAC’s mission, email to inquire about the process at info@massanimalcoalition.org. This MAC Program promotes and receives funds collected from the sale of the Animal Friendly License Plate through the Registry of Motor Vehicles. MAC annually awards grants to community based spay-neuter programs across the state operated by non-profits, and by coalitions of non-profits and municipalities. The license plates have been for sale since 2004. The hardworking 5-member grant awards committee consists of an animal control officer, a veterinarian, a MAC member, and two members of the shelter and rescue community. They review grant applications and make recommendations for funding. In 2018 $185,000 was distributed to 27 organizations and municipalities. Since the program began, thousands of animals have been spayed or neutered, with over $2.2 million awarded to organizations throughout the state. MAC strives to ensure that the sales of the license plates continue to be strong, including license plate renewals. In 2016 AniMatch for Cats was launched as well! Building on our years of experience working with dogs, similar programming was rolled out, which was designed to assist cats in need across the state of Massachusetts, and AniMatch facilitated the transfer of well over 220 cats and kittens since the inception of the cat part of the program in early 2016. AniMatch provides Canine Body Language and Behavior Observation training for participating organizations and volunteers considering becoming part of AniMatch. The goal is to enable participating organizations and volunteers to use the same standardized, objective criteria when posting available dogs on AniMatch’s database. When working with cats, AniMatch utilizes a succinct behavior observation (“Feline Personality”) form that provides a snapshot of a cat’s behaviors. These processes allow organizations to make realistic decisions regarding their ability to help a particular dog or cat. To date, AniMatch’s training team has “graduated” 177 Behavior Observers allowing teams of people to go out into the field to help ACOs and others. To date, 578 people have participated in the training and have taken what they’ve learned back to their facilities to share with their co-workers. Over the course of the program AniMatch has performed hundreds of behavior observations at the request of shelters, rescues and ACO facilities. AniMatch has been instrumental in establishing and encouraging collaborative partnerships between Massachusetts animal welfare groups and the team has learned so much about what ACOs face on a daily basis. These partnerships have developed and grown over time and have created a safety net, giving hundreds of adoptable dogs and cats in Massachusetts a second chance. AniMatch’s work is based on teamwork, trust building, commitment and networking and the team is humbled and proud to have served almost 3000 dogs since November 2007. AniMatch has been approached by various states and communities interested in replicating our Program and the team is happy to share its database, documents, and protocols. AniMatch facilitates happy endings for Massachusetts animals! Held three times a year, MAC meetings feature invited speakers addressing various topics of interest and importance to the Massachusetts animal welfare community. At each meeting, MAC members also learn about the progress being made with MAC Task Forces and Programs, and most importantly, the meetings promote vigorous discussion and positive interactions among the attendees. We hold at least three sessions a year, including “Hot Topics,” “All About Dogs,” and the “Whole Cat Workshop”. At all MAC meetings we work hard to address topics that are useful to many animal welfare groups and invite leaders in the field to be guest speakers or participate on a panel. On occasion we hold additional sessions as the need arises. Spay Massachusetts – “Spay Mass” for short – is a MAC program whose mission is to connect people in need of spay/neuter resources to 90 clinic locations throughout the state. Spay Mass provides an online resource to help Massachusetts residents locate low cost spay/neuter services with the online clinic locator tool which can be found at www.massanimalcoalition.org (click Resources and select Find a Spay/Neuter Clinic) or the page can be accessed directly at www.spaymass.org. While the public can access this tool, it is also used extensively by spay/neuter providers across the state to help the public locate resources the spay/neuter provider cannot provide, and to help those who cannot travel to that particular spay/neuter location. The purpose of the Task Force started in 2017 is to assist Animal Control Officers in educating the public about the dangers of pets being left in motor vehicles that get very hot or very cold inside due to extreme weather conditions. From November 2016, there has been a new law in Massachusetts, M.G.L. Chapter 140, section 174F, that prohibits this conduct. The law grants permission in an emergency situation to Police, Animal Control Officers, First Responders, and concerned citizens, after they first contact and gain direction from law enforcement, to free an animal suffering from the extreme heat or cold of a motor vehicle, without consequence. The owner and/or keeper of the animal can be charged with a first offense up to $150 with second and third offenses involving even higher fines, and they could potentially face animal cruelty charges. The Task Force plans to use social media and the MAC website to educate the public about these dangers, and assists Animal Control Officers to do the same with posters, brochures and signs to use in their communities. The level of shelter medicine education among Massachusetts shelter and rescue workers varies widely and “ESRO” was created with a goal of providing comprehensive training in animal health, basic medical protocols and husbandry to animal shelter/rescue staff and volunteers, bringing all personnel to the same high level of key knowledge by employing already established guidelines and protocols. By having a foundational training program to address the issues of animal health, both animal shelter/rescue personnel and the animals benefit. The curriculum has been completed and there was a “dress rehearsal” of the presentation and comments are now being integrated to create a final version. At that point Massachusetts shelter veterinarians will be the instructors at each ESRO training session. The Task Force has integrated Becker College in the process. One of the central tenets of MAC’s mission is to promote collaboration as well as provide educational opportunities. Another part of the mission is to play a leadership role in animal welfare in Massachusetts. This Task Force embodies this spirit. The Shelter Statistics Task Force recognized, as a first step towards improved shelter data collection, the need to better understand how information on animals sheltered in Massachusetts was collected, recorded, analyzed, and used. To that end, the Task Force engaged a Tufts Masters and Public Policy (MAPP) graduate student to assist with developing an online survey that was answered by approximately 25% of all municipal and private animal shelters in the state. Our findings indicate that a large proportion of homeless animals are sheltered by fewer than 10 large animal welfare organizations that have good data collection and use procedures. However, among the many smaller public, private and combination shelters, information collected on individual animals varies widely and is frequently not analyzed. For this reason, the ability of smaller organizations to use data for grant applications and reports to the public are limited which, in turn, limits their ability to raise funds to support their efforts. Reasons for limited data collection and use include lack of financial and technical resources and support, in particular among public shelters. A manuscript summarizing results of this project was submitted to the Journal of Applied Animal Welfare Science, a peer-reviewed journal, and we anticipate receiving reviewers’ comments soon. The Task Force’s intermediate-term goal is to develop and implement initiatives that strengthen the capacity of smaller animal shelters to improve data collection and use. We anticipate that this will, in turn, make statewide collection of high quality data on sheltered animals available to develop policies to reduce the number of homeless, neglected, displaced and abused companion animals in Massachusetts. In an effort to keep MAC members and friends informed about animal issues in Massachusetts, MAC has continued to improve its website and Facebook presence and offers e-alerts and e-newsletters about MAC’s work. We have also worked with Conover Tuttle Pace, a Boston-based advertising firm, to improve our outreach and license plate sales. There are a wide variety of useful informational resources for both the public and MAC members on the website. See www.massanimalcoaliton.org. MAC encourages organizational memberships and individual memberships. Individual MAC members receive discounted meeting fees and priority meeting registrations. Organizational MAC members receive free meeting passes, the number of which is dependent on an organization’s membership level, and priority meeting registration when using free meeting passes. MAC also offers meeting discounts to students. See the website for specific information about the different kinds of memberships and the benefits that go along with MAC membership. If you have any questions about memberships, please email the MAC membership committee at info@massanimalcoalition.org. Financials – Enclosed you will find a copy of MAC Financial information covering the 2017-2018 Fiscal Year and the prior 4 years. Thank you for your continuing support and participation in the mission of MAC.